Health plans play an important role in ensuring access to behavioral health services and MAHP member health plans follow nationally recognized clinical guidelines to integrate mental health, medical care and pharmacy services, and meet the specific needs of their members. Through case management initiatives, health plans work with providers and members to ensure that individuals receive the appropriate education, support, and coordination of care to follow through with prescribed therapies for treating behavioral health conditions. Health plans are subject to stringent standards in the coverage of behavioral health and substance use disorder conditions and other medical conditions. 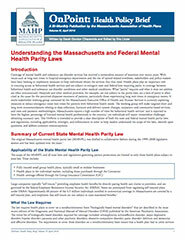 The policy brief examines state and federal mental health parity laws and regulations, providing an overview of what parity is and address misconceptions in the applicability, oversight, and enforcement of mental health parity.